1879 Coiled Hair PR 63 NGC. 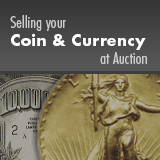 As interest in an international gold coin increased in 1879, both of the Mint's engravers were charged with designing a new coin for the "stella" or four dollar gold piece. Charles Barber's design employed a flowing hair motif, while George Morgan used a coiled hair design for Liberty. More than 400 of Barber's flowing hair design were produced in 1879, but Morgan's coiled hair pieces saw very limited production runs, most likely in the neighborhood of 15-25 coins in each of the two years they were struck. Akers estimates that perhaps as many as 13 to 15 pieces are extant today, while Breen stated that at least 10 pieces were known and estimated that 15 survive today in all grades. The issue was raised in both the Akers' text and the entry in Breen's Encyclopedia regarding restrikes of this issue. Only one was believed by Akers to make a convincing case for having been restruck. It shows adjustment marks on the obverse similar to those seen on the 1879 Flowing Hair pieces that are generally considered to have been struck in 1880. This piece is a bit softly struck over the ear as are all examples of this issue. There also are numerous very light "adjustment marks" on the figure of Liberty, marks that are more accurately described as roller marks rather than actual adjustment marks to lighten the weight of the planchet. However, in examining the few 1879 Coiled Hair pieces which we have been privileged to offer, there is no convincing evidence in our opinion to support any contention that these were restrikes from 1880.